As with any research report, however, it’s wise to look at the data, and the conclusions drawn from that information, with a critical eye. In this case, to their credit, the analysts at Software Advice are candid about their sample population (mostly large companies) and where their results align with, or depart from, other recent industry research. However, they also draw some fairly dramatic conclusions from the data that, in this view of this writer, don’t stand up to closer scrutiny. The conclusion that most caught my eye is the one that titles this blog post. 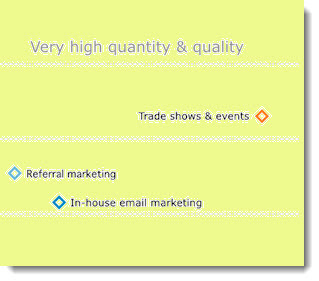 To quote the report, “Trade shows were most commonly cited as generating both the most and the best (leads) …” And indeed, the data supports that observation: 77 percent of respondents said that trade shows generated either “somewhat” or “very high” quantities of leads, and 82 percent said that trade shows generated leads of either “good” or “excellent” quality. Second, let’s consider what the survey respondents most likely meant by “lead quality” in this context. Consider a scenario: if I embark on a social media campaign, for example, generate a thousand leads, and two hundred of those leads convert to customers twelve months later, were those quality leads? Most marketers would say “yes,” except this survey doesn’t really reflect the long-term value, and thus ROI, of different channels. This is reinforced by another headline from the report: “Live Demo Offers Produce the Highest Quality Leads.” Again, this conclusion is based on more respondents naming demo offers as generating quality leads compared to other channels. Taken at face value, however, this implies that product companies should never engage in content marketing, or do anything other than offer prospects the opportunity to demo the product. Clearly, what’s being interpreted as “quality” in this context is in fact “qualified”. Sure, demos attract more qualified leads, because prospects who want to view the product are inevitably further along in the sales process. But does that mean that demos are the most effective demand gen offer? Far from it. In tests we’ve conducted over the years with our high-tech clients, information offers (white papers, case studies, Webinars) generate 3 times the response compared to demos and free trials. Now, it’s true that white papers generate a wider spectrum of leads – some highly qualified, some merely “tire kickers.” But a white paper campaign may still yield a higher ROI if the close rate on those leads is more than one-third the rate of a similar campaign in which the sole call to action is a demo. In fairness to Software Advice, the responses to the survey – and even the way the questions were structured – is also a reflection of the current state of BtoB campaign measurement. If more companies measured program ROI consistently, then you could ask “which programs generate the highest ROI” rather than inquire about the number of quality leads. Unfortunately, despite all the technologies available to us, the vast majority of B2B marketers still measure campaign success (and relative effectiveness) using metrics that fall short of the ideal. This entry was posted in B2B Marketing, Campaign Measurement, Campaign Planning, Campaign Strategy, Content marketing, Demand Generation, lead generation and tagged b2b demand generation, btob demand generation, demand generation agency, demand generation channels, demand generation effectiveness, demand generation strategy, Software Advice, trade show marketing, trade shows on November 14, 2014 by Howard Sewell. I enjoyed this post and agree with the arguments you presented, although I think I would have made a different argument here. This report seems to imply single channel attribution (first touch or last touch – I wonder if they defined which in their survey because it makes a big difference), as opposed to multi-channel. So, of course tradeshows would create higher value leads…the fact that people would take the time to talk to you at your booth implies that they are likely fairly deep in their buying cycle. But, how were they influenced before they became a “known” lead? And, we all know that once a prospect has requested a demo and volunteered to engage with a salesperson, they have a higher propensity to close than someone who downloaded a whitepaper. But, today’s buyers don’t waste their time scheduling demos to learn about new products – rather they research solutions in advance of engaging, identify a few potential solutions and then request the demo when they want to dive into details and get a feel for what the sales process will be like. What this report doesn’t account for is the value of multiple touches, e.g. the LinkedIn update that lead this prospect to your booth at the tradeshow, or the anonymous web visitor who frequently consumed content on your blog before requesting a demo. For that reason, this report seems outdated and promotes thinking that is counterintuitive to what we know works in today’s environment. It suggests that one channel or offer is superior to another without accounting for the fact that buyers are influenced by content and offers promoted in many channels and that first or last touch attribution only tells part of the story.